The list of the main iOS music-making apps I used heavily and followed closely in their development this past year is somewhat boring, in that it largely consists of backend software. A whole suite of third-party tools has come to the fore in recent years in order to provide an ad hoc infrastructure for sharing sounds and computer instructions between apps, and between the iPad and other equipment. Of these following four only Aum was new in 2016, while the others saw various updates and upgrades. I’ve put Aum first because it’s new, and the remaining three are in alphabetical order. (1) Aum: As with all the apps in this sub-category, Aum seems like the sort of thing Apple should simply purchase and make part of the iOS backend. 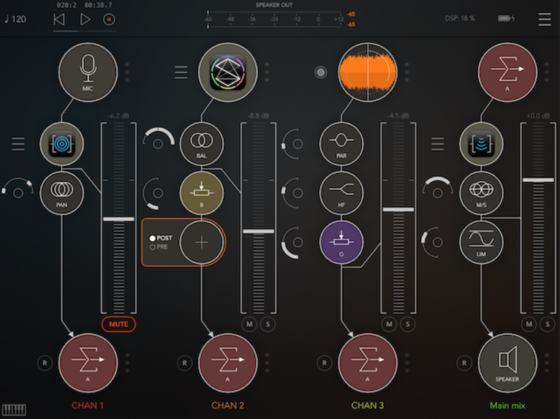 The company responsible for it describes it as “a flexible audio mixer, recorder, and connection hub,” but that really doesn’t do justice to how it will immediately become the home base for all your music making on an iPad once you start using it (kymatica.com, itunes.apple.com). Pictured above. (2) Audiobus: There may not be another piece of software that is more requested for developers of music apps to include as part of their own releases. Audiobus is the de facto sound router for iOS, allowing for an enormous (and growing) library of apps to send sound back and forth (audiob.us, itunes.apple.com). (3) AudioShare: By the makers of Aum, this is a simple, elegant, and highly effective means to store and share audio files (and MIDI files) between apps. It’s been around since 2012, and its last major upgrade was in late 2015, though in early 2016 slide over and split screen support were added, which is especially helpful with infrastructure apps (kymatica.com, itunes.apple.com). (4) SilQ: Excellent, narrow-focus (32-band) equalizer that works via Audiobus (see above). I’m especially hopeful for MIDI implementation (tonapp.no, itunes.apple.com). (5) Blocs Wave: Novation already had a success on its hands with its Launchpad app when it launched this fluid, efficient, and pleasurable approach to sample-based sound production (blocs.cc, itunes.apple.com). (6) FieldScaper: This experimental sound manipulation tool by Igor Vasiliev is far from anything I’ve come close to mastering, but I find myself going back to it again and again to morph sounds and gain competency with its intricate toolset. The app debuted in late 2015, and this year it got even better with the addition of recording and editing features (motion-soundscape.blogspot.com, itunes.apple.com). Pictured above. (7) H–r: This app is a creative resuscitation and refashioning of one of my favorite apps of all time, the RJDJ app from Reality Jockey. Alone among the apps I’m highlighting this year, H–r is where I always thought apps were headed, which is to say it provides a platform for the casual reimagining of sounds and environments. In fact, most music and sound apps these days have music producers, professional or not, in mind, rather than everyday consumers, but H–r (it’s had some issues with its name since launch) provides hope that audio-games and audio-toys still have a future. (hearapp.io, itunes.apple.com). (8) Korg Gadget: Korg has virtually reimagined itself as a software company, so rapid fire is its release schedule of iOS apps. This is a massive one, loaded with a variety of, per the name, audio gadgets, and it appears Korg has no plans to slow down its expansion. (korg.com, itunes.apple.com). 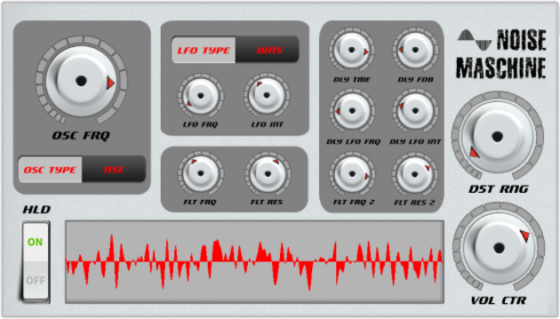 (9) LoopyHD: This is arguably the most user-friendly audio looper available. It appealed to me initially because it allowed for easy desynchronization of loops. Many loopers, software and hardware alike, seem to assume the user wants a steady beat, but while Loopy is great for building songs in realtime, it also allows for layering of asynchronous sounds. I use it just as often with outboard sound sources, like Buddha Machines and the squelchy feedback of a no-input mixer, as I do with intra-app audio (loopyapp.com, itunes.apple.com). (10) Various: When something like Korg Gadget costs upwards of $40, and is supported by a major music-technology company that’s been around for over half a century, it can be unfair to put it up against the wide range of inexpensive little apps out there, so I wanted to reserve space to note things like the free MIDI Wrench, which monitors MIDI communication and can be useful during troubleshooting (itunes.apple.com); the $0.99 Lofionic Duplicat, which simulates tape delay (itunes.apple.com); the whole suite of Timothy Barraclough’s $0.99 mini-apps (especially Dahlia Delay, Saffron Saturator, and Buttercup Bitcrush — more at timothy-j.com); and the free Hexaglyphics noise generator (itunes.apple.com). Listing 10 (or so) iOS apps here is just the tip of the iOSberg. The high priority assigned to Aum and Audiobus is that I use them to connect so many other apps, including delays and noise sources, effects and sequencers, too many to list here. For solid retrospective insights on iOS music-making, I recommend the year-end articles on two great dedicated music-app sites: musicappblog.com, from John Walden, and palmsounds.net, from Ashley Elsdon. In addition to my iPad Mini 2 (which I expect to upgrade in the coming year, as the old CPU is getting laggy, and I’d like something larger, especially for the modular-synth apps I’ve been fiddling with — and because I need more memory; Korg Gadget alone is over 600MB in size), I have an Android phone, currently the Nexus 5X. While Android is quite behind iOS in music-making software, there is a growing library of useful tools. This year I’ve made a lot of use of these 10 in particular, none of them necessarily new (though Caustic 3 got some great upgrades this year), mostly on the bus and while waiting for movies to begin, and as short-notice inputs for my modular synthesizer and looper. These are listed in alphabetical order. 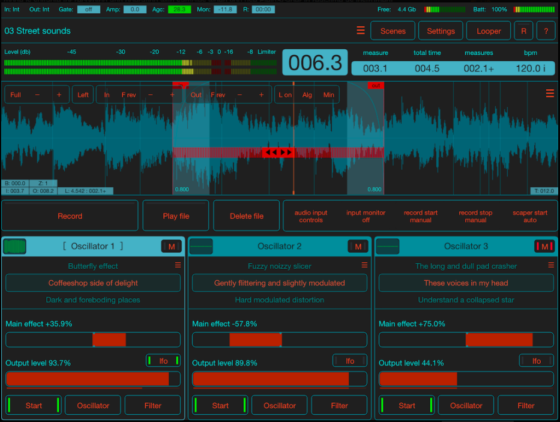 (1) Caustic 3: A powerful and ubiquitous cross-platform music construction kit, packed with synthesizers, drum machines, a sequencer, and effects (play.google.com singlecellsoftware.com). (2) Circle Synth: A simple sound generator from Two Big Ears, which earlier this year joined Facebook’s VR and AR development group. This appears to be unique to Android (play.google.com). (3) Common FM: A simple synthesizer employing frequency modulation, and it comes packed with presets. This appears to be unique to Android (play.google.com). (4) DRC: A polyphonic synthesizer with a great user interface. Admirably, it’s also available for Windows, iOS, and Mac OSX. I use more powerful tools on my iPad, but on a phone-size screen it’s perfect (play.google.com imaginando.pt). 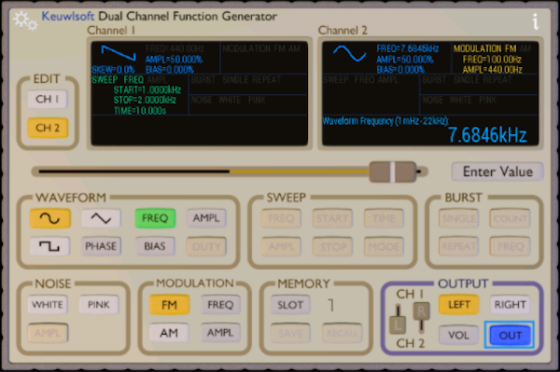 (5) Function Generator: From the prolific keuwl.com app foundry, this is a nifty stereo waveform generator. This is unique to Android (play.google.com keuwl.com). Pictured above. (7) Noise Maschine: An excellent noise generator. This appears to be unique to Android (play.google.com). Pictured above. (8) Saucillator: A loop-oriented tactile synth by Matt Feury. This appears to be unique to Android (play.google.com). (9) S.A.M.M.I. : A great little sound-experimentation app with a sequencer, drone machine, and theremin. Also available on iOS (play.google.com, futronica.com). 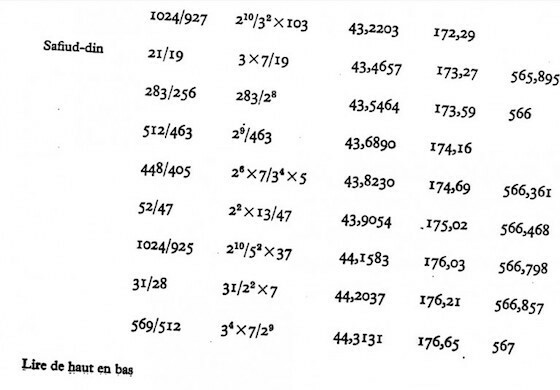 (10) SphereTones: A touch instrument with excellent random/counterpoint opportunities. Also available on iOS (play.google.com, binaura.net). The above image is from the initial promotional material for the Android-powered LG G Watch. It is showing support for “Ok Google,” which listens for that phrase as a prompt. Of course, in order to do that, the watch has to be always listening. As useful as the concierge-ish search is, of all gadgets a watch needn’t have to listen — you could just, you know, hit a button. Also from the promotional language: “It doesn’t just listen well, it communicates with you well: straight answers to spoken questions.” The initial specs don’t seem to note the inclusion of a microphone.